History is dramatic—and the renowned, award-winning authors Christopher Collier and James Lincoln Collier demonstrate this in a compelling book aimed at young readers. Covering American history from the founding of Jamestown through present day, this volume explores far beyond the dates and events of a historical chronicle to present a moving illumination of the ideas, opinions, attitudes, and tribulations that led to the birth of this great nation. 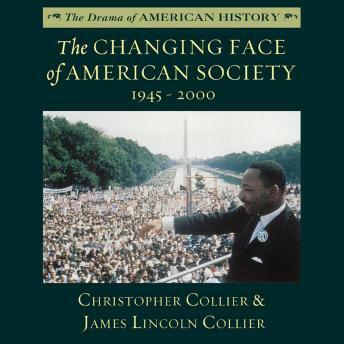 The Changing Face of American Society chronicles societal changes in the United States during the second half of the twentieth century, including the women’s movement, civil rights gains, technological innovations, and advances in medicine. This book summarizes the important themes that took place between the years 1945 and 2000 and what they mean to us now.